Every 2nd Monday of the month we get together with a few of our blogging friends to participate in a fun challenge. This month we were challenged to create a project using cardboard, paper or wood. This past month, we've been unpacking, organizing and arranging our new apartment, so all my energy has gone into projects that have to do with those priorities - crafting is not really possible until we get this done. But one challenge we had in our new space was what to do with our bookshelves - we can't get rid of them, because after a deep culling of our book collection, we 'd managed to clear away one, at most, out of four matching bookcases. We have two of them in the room that will become the craft space, and that left two that needed a place to be. 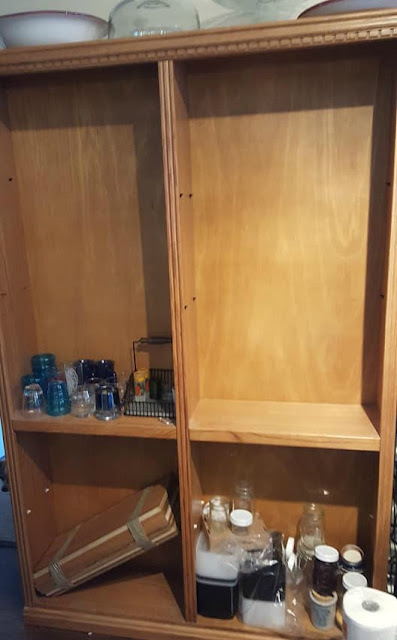 Another problem is that some of our dishware needs a home - neither our kitchen cabinets nor our baker's rack will contain it all (we're going to need to cull some of this too, but we aren't there yet). After a lot of thought, we realized the two bookcases would need to go along the dining area wall along with the baker's rack, so that they could contain my cookbooks and a few other books, as well as some of our glassware and serving dishes. I wasn't thrilled with that solution - the 'wall of brown wood' looked tired and darkened up the space. At some point I may get very ambitious and paint them - but that won't happen soon. Meanwhile, we needed them in place so we could unpack. The roll I bought was more than enough to cover the top portion of the shelves, with more left over for future projects. With the shelves off, it was easy work to apply the peel and stick to the back once we'd made careful measurements to ensure they were lined up properly (with all those straight lines, I was worried about putting it up even slightly crooked). But once we'd peeled a little of the adhesive at the top of the paper and got it laid in the right place, it was easy to apply it firmly all the way down, peeling off the backing as we went. I found that the paper was not difficult to lay flat without bubbles, smoothing it gently as we went. With just a small bit of overhang on the top and bottom, it was fast work to cut it cleanly with a small box cutter style razor. 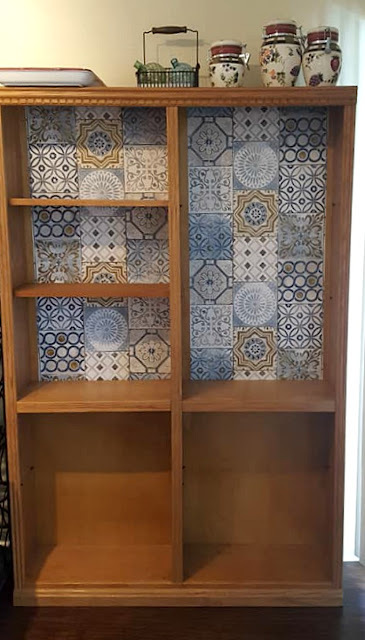 The paper itself was about 1.5" more narrow than the back of the cabinet - due to the pattern, I didn't want to try overlapping for full coverage. At some point I may decide to lay coordinating strips on each side but for now, I don't really mind - especially once the shelves were put back in. At this point, the shelves aren't arranged at all, but we got a lot of boxes unpacked, are working on deciding what needs to be re-homed and this whole space should look uncluttered soon. Every time we move, I swear I never want to go through this again - but this little project did make me feel like we are getting somewhere that will make it pretty as well as functional. The best part is that this brand of paper is meant to be easily removable, so whenever I'm ready to do something different, it should be easy work to make it happen. Now we invite you to join us in the fun! 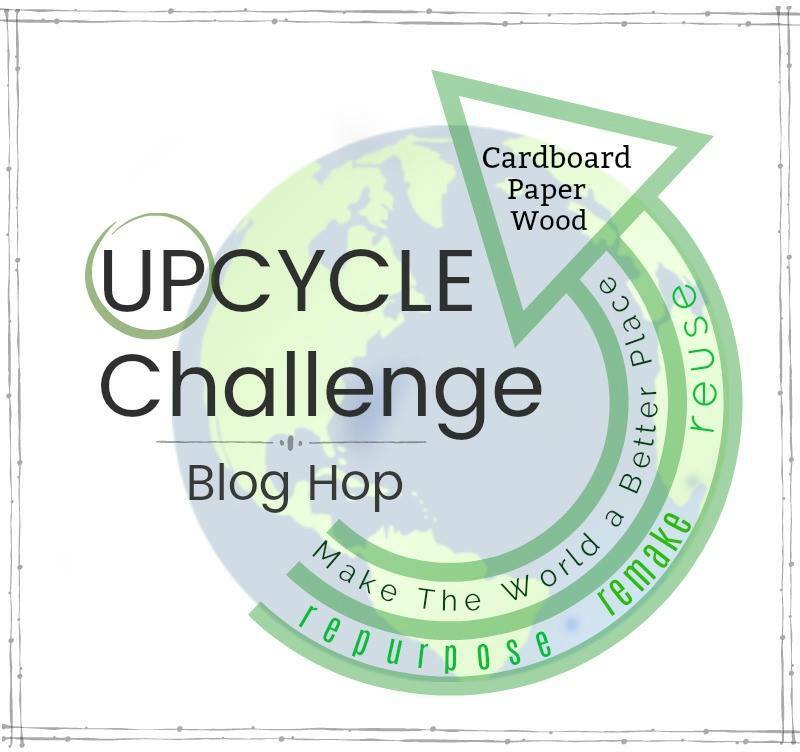 Use the links below to hop over and visit with our blogging friends to see the projects they are sharing today for the Up-cycle Challenge!! That was a great change. Good luck with all your moving. Slow and steady wins the race. I've used peel and stick tiles and they are really even better looking than people can imagine from the photos. That's a lovely idea to add paper to the back of your bookcases, Lynda! It gives off a pretty vibe and certainly enhances the look of your storage spaces! Using contact paper for the back wall of the shelves is a great solution to them being so dark. It adds lots of interest to them. I've got a shelf in mind that could use an update. Thanks for the idea! Lynda, I love the paper you used for the back of the shelves! So pretty. I've not seen paper like that before. Amazing how just a little bit of paper at the back of a bookcase can make such a difference. They look wonderful! Pinning to share. What a great way to add some color while getting everything organized! I never even noticed that the paper was slightly narrower than the back until you pointed it out! I love this tile paper, it looks great and the idea of using a peal and stick must have made it easier. Oh, it looks so pretty! I love re-purposing and up-cycling furniture and I am always looking for inspiration :). I love upcycles, repurposing, etc and this turned out great! Thanks for sharing on To Grandma's House We Go! Lynda it looks really great. The backdrop is gorgeous! I have a medicine cabinet that needs some TLC, and I have thought about using some type of paper on the inside of it. I need something that sticks really well since it is in the bathroom. I love your idea. The shelves went from plain to pretty! What a great upcycle! Thanks for sharing with SYC. Great idea to use contact paper to brighten it up. Bonus points for being removable for later! I just LOVE the way it turned out. It looks SO good. Love the paper you chose! Thanks for sharing with us at the To Grandma's house we go link party! I love how it turned out. I'll be Pinning this for feature reference. Thanks for sharing on Sunday's Best.